Displaying photos of your cakes in a gallery is a great way to showcase your skills and give potential customers an idea of what they can expect when they order from you. But, what if you offer more than just cakes? Or what if you offer a few specific types of cakes? Rather than having everything mixed in together, sorting you photos into several categories gives your customers a quick and easy way to view exactly the product they’re looking to buy from you. Currently, there’s a two ways you can do this on your BiziChix website. 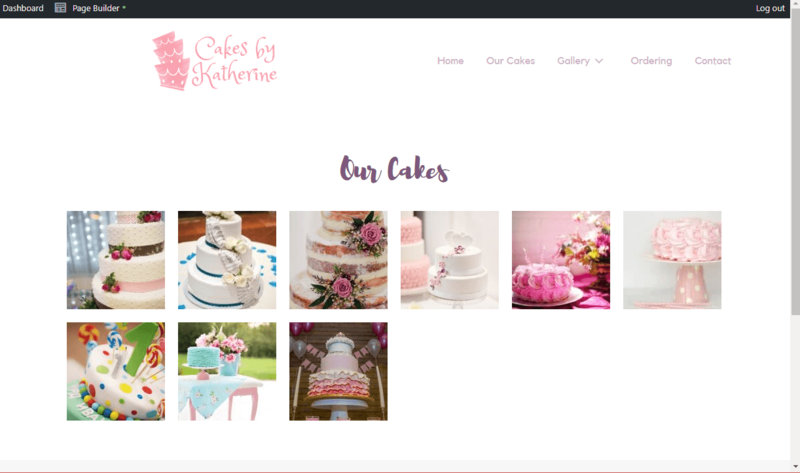 In our examples, we’ll be adding 3 galleries: one for Cakes, one for Cake Pops and one for Cupcakes. Option 1 – Display several Gallery Modules on the same page. This is the quickest way, and probably the best option if you only have a small number of products in each category, or a small number of galleries. If you have more than around ten items in each, we recommend option 2 below. Open the Page Builder on the page you want to add the gallery. (If you’re not familiar with how to use the Page Builder yet, please check this tutorial first). Place a Heading Module on the page with the title “Gallery” (or whatever you’d prefer to call it). You’ll probably want to make the size H2. Next, place another Heading Module underneath the first and enter the description for this gallery. For our example we’re calling this one “Cakes”. Make the size H3. Next, drag a gallery module onto the page under the last heading module. Add any of the photos to it you’d like to display. We’ll add cake photos. Repeat the process for the additional galleries you want to add. 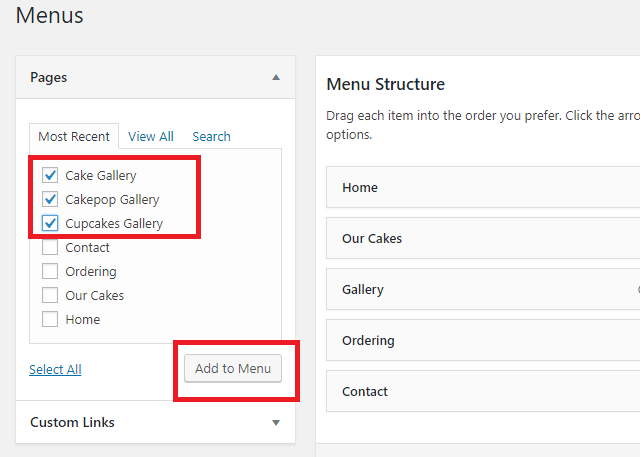 For our example, we’ll add a Heading Module underneath the Cakes gallery and call it “Cake Pops”. We’ll then add another Gallery Module and add photos of our cake pops. Repeat this for any other galleries you’d like to add, then click Done and Publish. Your site now has multiple galleries for the different products you offer. Option 2 – Display several Gallery Modules on multiple pages. This is the best method if you have a lot of images or many different categories of products. We’re going to start by creating a page for each category, then we’ll add a link to each page in our navigation at the top of our website. Click on Pages in your Dashboard. Then click Add New. 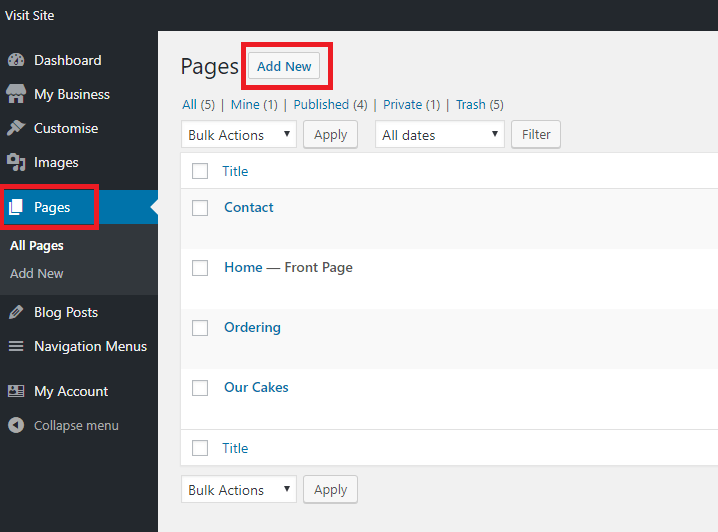 Once the new page loads, enter the title of the page you want to create, then click Publish. Repeat this for all the pages you want to create galleries for. In the URL field enter a pound symbol ( # ) and in the Link Text field enter “Gallery” (you can call it what you like). Then click Add to Menu. Click and drag the new link to position it on your menu. Next click on the Pages dropdown. 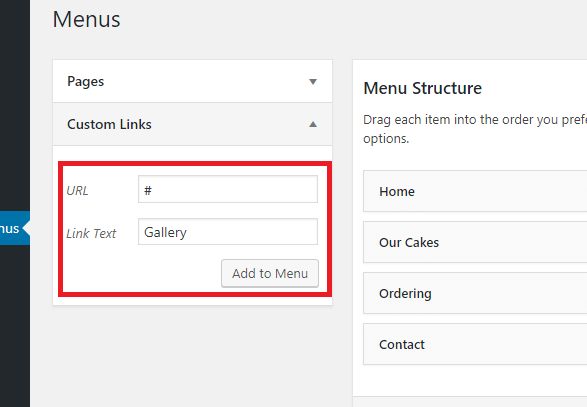 Check the boxes of the gallery pages you created in the previous steps, and click Add to Menu. Then drag them up to position them under and slightly to the right of the “Gallery” link. Click Save Menu. You can now visit your site to see the links to these new gallery pages. Now we need to add our content to these new pages. Click on the link to the first page, then open the Page Builder. Drag a Heading Module onto the page with the title “Our Cakes” (or something else you prefer). 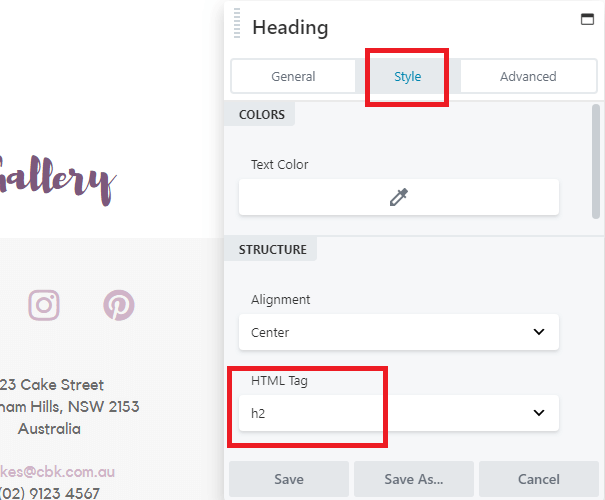 Under the Style tab, change the HTML Tag to h2. Then, drag a Gallery Module onto the page and add your photos to it. Click Done and Publish and then repeat this process for any other gallery pages. © 2016 - 2019 BiziChix. All Rights Reserved.